We’ve all been there – grocery shopping with kids. While there are ways around it – going when they are in day care, going when your partner is home to watch them or using online shopping – sometimes a trip to the shops with children in tow is unavoidable. So, the next time you go, make it a little more entertaining by seeing how many of these things you can check off the list! We bet at least half happened to you on your last shop and the other half will happen next time! 1. 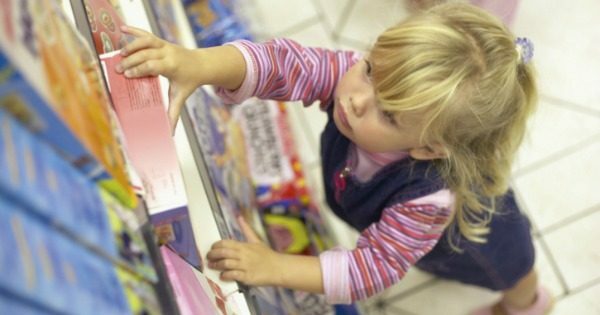 Your child has a meltdown – This will most likely happen in the middle of the store. The busier the store, the louder the tantrum will be. 2. Your child refuses to sit in the trolley. Then your child decides she needs to push the trolley. It takes you ten minutes to go through one aisle before she gives up and decides that she needs to be carried the rest of the time. You resort to bribery to get said child back into the trolley. 3. You open at least one item before you reach the checkout. This item is now half chewed on the bottom of the trolley with your child’s shoes and the shelf price tags that he has been ‘collecting’. 4. When unpacking the trolley you find at least one item that you did not put there. It will most likely list ‘sugar’ as a main ingredient. 5. The kids ask for a treat. The kids ask for a treat. The kids ask for a treat. The kids ask for a treat. 6. You give the kids a treat. 7. You buy more than four litres of milk. And a jumbo pack of wipes. 8. Your child complains of being cold in the frozen section. 9. You walk past another mum with well-behaved children. And you want to switch lives. 10. Your child decides he needs to go to the toilet. Or, if you have a baby, she does a number three just as you are about to go through the checkout. 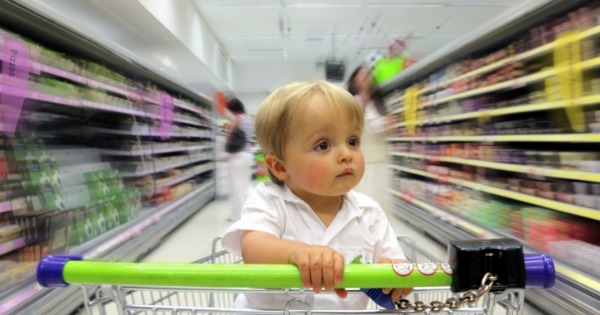 If you are shopping with both a child and a baby, both will happen… but not at the same time. 12. You reach the register and unload your groceries to realise you left your wallet in the car. Or at home. 13. When you do finally make it back to your car with the groceries, you discover that your toddler has swiped something from the lolly section at the checkout. You contemplate returning to the shop to pay for it. You decide against it. 14. You’re in the car and heading home and one of three things will occur. Your child will fall asleep in the car seat. And you will play the internal mind game of deciding whether to continue to drive around the block or risk moving him into his bed. If you are extra lucky, all three will happen. 15. As you bring in the groceries, at least one bag will break. It will most likely contain glass jars of jam, pasta sauce and Vegemite. And it will spill everywhere. You will also try to carry all 17 bags at once, all in one hand. 16. And, finally, you buy takeaway for dinner that night. 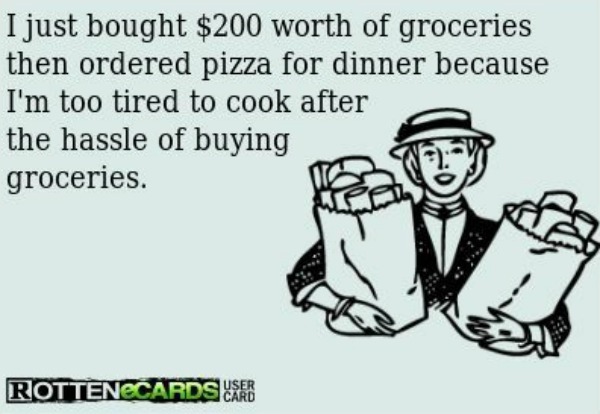 Because shopping for food has left you too exhausted to cook. Any of these things ring true for you? Share the love and pass this list on to some of your friends who could use a laugh or two.